In May 2013, a group of South African designers came up with an idea to celebrate the life of Nelson Mandela by collecting 95 exceptional posters from around the world, honouring Madiba's lifelong contribution to humanity. The independent team of volunteers, now known as the Mandela Poster Project Collective, gave freely of their time and expertise to make the exceptional happen: In 60 days more than 700 posters were submitted by designers from more than 70 countries. 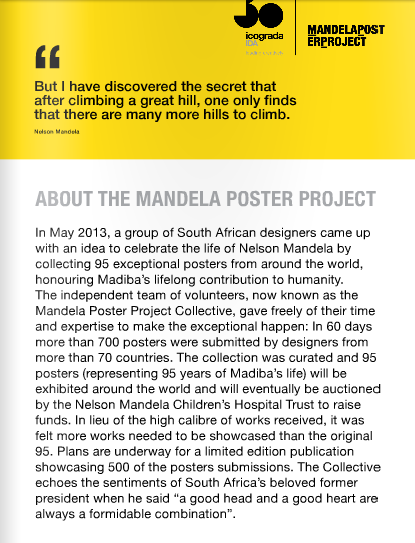 The collection was curated and 95 posters (representing 95 years of Madiba's life) will be exhibited around the world and will eventually be auctioned by the Nelson Mandela Children's Hospital Trust to raise funds. In lieu of the high calibre of works received, it was felt more works needed to be showcased than the original 95. Plans are underway for a limited edition publication showcasing 500 of the posters submissions. The collective echoes the sentiments of South Africa's beloved former president when he said "a good head and a good heart are always a formidable combination."